You can validate parking at just about any casino downtown, but that validation is only good for 3 hours. Since I intended to take this thing down — the $65 Saturday No-Limit Hold’em event at the Golden Nugget — I parked in the free lot at El Cortez and made the short walk to Fremont Street. I suppose I could have chosen to valet, but then I’d miss the “experience” of strolling past showgirls in mink coats, checking out Mardi Gras bead souvenirs, snapping a picture of tiny Elvis or Pirates of the Caribbean Johnny Depp and basking in all that neon. The Golden Nugget poker room sits in a casually lit atmosphere with an appropriately golden hue. I noticed a sign for a $100 event every Sunday at 9am. Wait, are there people in Las Vegas who actually wake up early enough to play that? I plopped down $65 for the 3pm freezeout, where I ran into a local grinder who had crippled my stack the night before at Orleans when he flopped a flush against my third-nut flush draw. He was downtown to play the uncapped buy-in cash games, though, and not punish me for tournament missteps. The Nugget might be a small room, but its one of the few 1/2 games in Las Vegas with no max buy-in. Still, it wasn’t like people were buying in big just to bully. 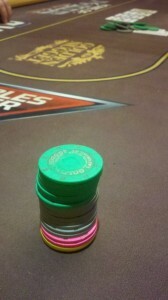 Most of the big stacks were playing less than $1,000 deep, grinders picking off tourists $100 at a time. Turns out, Saturday’s $65 event really costs $105 if you want a legitimate shot at taking it down. The entry fee gets you just 4,500 in starting chips (not even 100 BB! ), but anytime within the first hour, an additional $40 will get you 4,000 more. At my table, the lone player who chose not to add on would be the first player eliminated after the break. The tournament’s turbo-like structure would prove much more difficult than the field — 20-minute levels, doubling blinds, with a small starting stack — but most of the players probably didn’t know the difference. In one hand, I watched an extremely nervous guy check-call an A-7-A-8-8 board while holding A8. I guess he was worried about his kicker more than being accused of soft-playing his opponent on the beige felt emblazoned with logos from the glory years of televised poker (Poker After Dark, High Stakes Poker, WPT Boot Camp), much of which was shot here. There was no tournament clock in sight, so we had no idea how much we were playing for. After surviving the first hour, I approached the tournament director to ask him how many people entered and what first place paid. There were 30 entrants, with 4 spots paying out and the top prize of $1,150. Of that entry fee, 3 percent went directly to the house and $5 from each entry went to the dealers. I clung to my tiny stack as blinds escalated, but struggled to find spots to pick up chips, and eventually would exit in 13th place before heading back toward the El Cortez. I called Mandalay Bay and inquired about their 5pm $100 bounty event. For every player you knock out, you receive $25. Sounded cool, and I’ve never played a bounty event, so I headed over. Unfortunately, with only two other players signed up, the tournament didn’t make. With a limited list of Sunday night tournaments, I broke down and threw out my plan to avoid Venetian’s Deep Stack Extravaganza because I knew for sure there’d be action. (They run the Deep Stacks four times a year, with a few dozen tournaments each time, so it’s sort of like a “daily”.) And after my run in smaller events at Stratosphere, Orleans, and Golden Nugget, it seemed the right time to see how I could perform with the low-stakes sharks — so many of whom dressed the online poker nerd part. Perhaps strangely, this go-round all Deep Stacks events are held on the casino floor at the Palazzo. 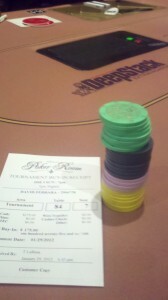 The $175 7 pm event gets you 10,000 starting chips. 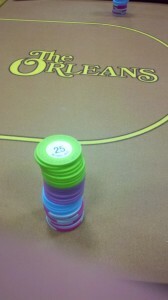 Out of the entry fee, $20 goes to the house and $5 is for “staff bonus.” The 30-minute levels start with 25/50 blinds. A rebuy is allowed within the first hour-and-a-half. On this night, the tournament was relatively small — with just 87 entrants, and about a $4,000 first prize — but still more sizable on most fronts than all the other regular tournaments in Las Vegas. The field didn’t seem as tough as I imagined, but in my first four attempts to raise preflop, I got 3-bet three times. So it definitely played differently than the Stratosphere. My previously “deep” stack shrunk to about eight big blinds, when I got it in with AK against A3 and JT. The king-high flop looked great, but the Q turn and A river delivered a crushing blow. Two hands later, with less than a big blind left, my pocket deuces got cracked to end my tournament dreams … at least for the night! But shuffling past the tournament rope to exit, my 0-5 start didn’t feel all that bad. The competition was surprisingly soft, and I was OK with my play. But without anything to show for my roughly 12 hours of play, I grappled with shouldering the weight of the grind. Two more days left in this week-long experiment — Caesars Palace and Bellagio next — and I have confidence that, with a little help from the cards, I can make a score. Which tournament had the hottest dealers? Not to answer for Dave, but supposedly M Resort has the hottest poker-room staff in town. None stuck out among these three, but I’ll have to get back to M soon.